It was, and still is, all about finding and reporting the most important, hard-hitting, relevant and interesting information on any given day. Because we don’t follow the drumbeat of the mainstream media, we’re free to focus on what’s important to real people, without the phony-baloney hype and agenda-driven reports that seem so ubiquitous in today’s news industry. And what's Kovacs' latest contribution to serving up "the real news, The news that matters" at WND? Suggesting that President Obama had something to do with the death of a medical examiner. At no point does Kovacs even bother to establish that Corimer was involved in any way with Breitbart's autopsy, let alone any personal involvement by Obama in anything. Oh, and as it turns out, LA Weekly learned that Corimer played no role whatsoever in Breitbart's autopsy, meaning that Kovacs' entire article is a sick joke. What we learn from this is that Kovacs did not join WND to engage in disseminating "real news." He is a conspiratorial right-wing hack who wanted an outlet for his hack work, and WND -- which is in the midst of turning itself into an anti-Obama super PAC -- is the home for conspiratorial right-wing hacks. This shows that there seems to be another reason Kovacs ditched thte "mainstream" media for WND: The mainstream media follows mainstream journalistic and ethical standards. WND has no such encumberances on its so-called journalism. Put simply, WND is the only place Kovacs could publish this steaming pile of feces he calls a "news" story. Yes, Craig Bannister really did headline his May 1 CNSNews.com blog post this way: "Was Panetta Just A Pawn In Obama's Bid To Mislead Americans And Slip Out Of The Country Unnoticed?" And yes, Bannister does spend his blog post whining that the White House did a few deceptive things, including placing a meeting with Leon Panetta, on the White House schedule in order to obscure the fact that Obama was actually on his way to Afghanistan. He huffs: "And, what's with all the cloak-and-dagger secrecy, anyway? I don't know about the rest of you. But, I, for one, resent being duped." President Bush (search) flew in under the cover of darkness on Thursday to dine with U.S. forces at a Baghdad International Airport mess hall. It was the first trip ever by an American president to Iraq — a mission tense with concern about his safety. Bush's surprise trip delighted troops and stunned the nation -- including the president's own parents, who had traveled to Crawford, Texas (search), expecting to spend the holiday with their son. Media outlets were reporting on Thursday morning that Bush would be at his ranch all day, only to be told the truth after the fact, when he was safely in the air and headed back home. It appears Bannister is so petty in his hatred for Obama that he will criticize him visiting the troops in a foreign country. Yet, Joe the Plumber insists he doesn’t question Obama’s faith. Barack Obama has been at war with God before he took office and ever since. As studies undermining the Media Research Center's cherished agenda of liberal media bias continue to pile up, the MRC has been furiously spinning them away. The latest offender is a Washington Post article examining the idea of liberal media bias. 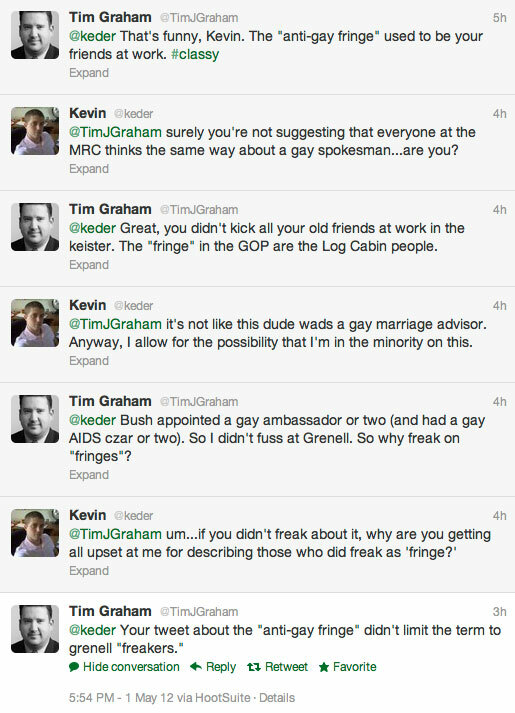 Tim Graham, needless to say, does not approve. Saturday’s Washington Post included a story dismissing the public for believing the media has a bias, complete with the headline “Public has its own biases about media.” It sounded like a twist on "I Know You Are, But What Am I?" Media reporter Paul Farhi argued studies finding an increased perception of the media favoring “one side” since 1985 are somehow dashed because professors and their studies disagree. Graham goes on to praise Farhi for citing right-wing media critic Tim Groseclose's claim that pretty much every media outlet has a liberal bias, then criticized him for having "quickly dismissed him" (though neither Graham nor Farhi noted the shaky methodology that Groseclose employed to reach his dubious conclusion). Graham then attacks a researcher Farhi cited, David D’Alessio, who points out that left-leaning reporting is balanced by reporting more favorable to conservatives. Graham then bashes Farhi for not identifying D’Alessio as a "liberal," even though the only evidence he offers to back up that claim is that he once "attack[ed] Richard Nixon" -- actually, D'Alessio was citing Nixon's attempts to manipulate the media by attacking its objectivity, something that the MRC is still doing today -- and that his conclusions deviate from the MRC's right-wing agenda. Graham then nonsensically claims: "The story denying liberal bias only underlines liberal bias." Well, only if you work for the MRC, which starts with the partisan-driven -- not research-driven -- conclusion of liberal bias and then selectively cite evidence to back it up. Dear Paul: FAIR was founded in 1986, and the MRC in 1987 (and technically, Brent Bozell's and Brent Baker's MRC was under way at the National Conservative Foundation in 1985). It's at best misleading to pair the MRC on a timeline with Media Matters, which Hillary Clinton helped start in 2004. The MRC, celebrating its 25th anniversary this year, deserves to be in a "long ago" sentence. Here's the big picture: the liberal media may not be more biased to the left today than it was in the of Reagan's tenure in 1985, but that's not the point. The point is the public is smart/jaded enough to realize now that the liberal media can't pretend not be liberal -- and yet, they keep pretending. Farhi's piece reads like "there's little to the idea we're more biased than we were in 1985 -- and we were denying it, then, too." Graham doesn't seem to know the difference between political talking points and research. And if you've seen what passes for research at the MRC, you'd know why that is. Back in 2006, we detailed the links WorldNetDaily had in its early years to an evangelist, talk-radio mogul and accused cult leader named Roy Masters. There was one thing we had trouble nailing down at the time: whether WND was originally headquartered on Masters-owned property in a remote area of Oregon. We knew it was near, but not if it was actually on. I was finally brought aboard in October of 1999 to be the guy who puts together the WND news pages and write catchy headlines. Moving from South Florida to the northwestern part of America was a big change. There was hardly anything in Josephine County, Ore., that resembled civilization as I knew it. It was like I somehow traveled through a time warp and ended back in the Old West. There was one lonely Burger King present in a town called Grants Pass, so I figured it had at least some connection to the 20th century, which was about to change into the 21st. The original WND “headquarters” – if you can call it that – was in an extremely remote location called Selma, Ore., adjacent to Cave Junction. The office consisted of a glorified barn situated on Tall Timber Ranch. Tall Timber Ranch is owned and operated by Masters' organization, the Foundation of Human Understanding. That ownership is confirmed in an appellate court filing denying Masters' FHU a church tax exemption. Meanwhile, Masters' son Mark continues to operate Talk Radio Network, which syndicates the likes of Michael Savage, Laura Ingraham, Monica Crowley and (of course) Roy Masters. So thank you, Joe, for filling in a missing puzzle piece on WND. Now, how about explaining why you, Joseph Farah and crew spent so many years hanging out with an accused cult leader? Newsmax's love affair with Newt Gingrich may be doing a slow, hard death, but that just means that Ronald Kessler can engage in Romney-fluffing -- which he's been doing since, oh, 2007 -- with increasing impunity. One thing Romney will not do is boast about how he saved the life of the teenage daughter of his Bain Capital partner Robert Gay. As noted in my story Media Suppress Romney’s Human Side, Romney organized a successful effort to find her when she had disappeared in New York. He wound up rescuing her when doctors determined she was just on the verge of dying from a massive overdose of ecstasy. Of course, Romney doesn't have to boast about that when surrogates like Kessler will happily do it for him, as he's been doing since, oh, 2007. Noel Sheppard uses an April 26 NewsBusters post to have a fit over MSNBC's Martin Bashir pointing out that "the sort of comedy" that Rush Limbaugh enjoys "generally is sexist, homophobic, and racist." For all of his fulminating -- the most he can muster is bashing MSNBC as "a channel that claims to be a news network" -- Sheppard makes no effort whatsoever to disprove Bashir's assertion. Perhaps that's because he knows Bashir is right. Racist? Check. Homophobic? Check. Sexist? And how! If Sheppard couldn't deny the truth of Bashir's words, why is he attacking Bashir? Becuase he told the truth about Limbaugh, and Sheppard is apparently incapable of accepting the truth about his hero.